Today I am 26. Last year, when I turned 25, I made a few goals, which I posted for the world to judge on this blog. They were: 1. Not die while running. Or at least, run one mile without having to walk. 3. make a flying geese quilt. Now, with 365 more days behind me, this is what I've accomplished towards those goals. Goal 1: Run a mile without walking. It is quite amazing that last year at this time I was only just a few weeks into my Couch-2-5k app. I remember the day in October when I ran a whole mile without stopping to walk, for the first time in my entire life. It's actually quite inspiring to reflect on that now, since I've been in a running rut all summer and have needed to take walking breaks in between bursts of running. And I'm slow; I'll always be slow. I'm ok with that. But I spent the winter being awesome at running, in no other way than that I kept on doing it, didn't hate it, and felt especially great when I was done with a route. I really hope it comes back to me when the weather turns for good to those crisp fall and winter nights that witnessed it last year. Not being able to afford a gym turned out to be the start of a pretty incredible challenge, new activity, and goal MET. Goal 2: Write a novel. I am ninety percent through the first draft of my novel, by my best estimate. So I can't exactly check this goal off my list. But the fact that I didn't give up either and I'm still plugging away is more significant than finishing by this self-imposed deadline anyway. And I've written, to date, 117,482 words towards my goal. *The average novel is between 50,000 and 150,000 words. 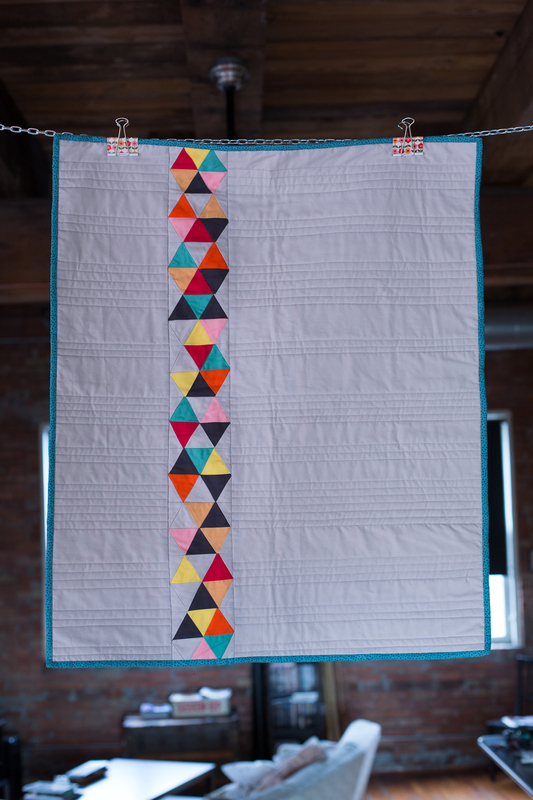 Goal 3: Make a flying geese quilt. Ah, yes. The flying geese quilt. Well, I did make some flying geese. I have a few rows of them and I'm liking them more and more the longer I fiddle and ponder them. But I did not, alas, finish a flying geese quilt by my 26th birthday. But the main reason for this is that it ended up being quite a year for births and marriages, and though the list of people I might make a quilt for is small, many of them had these major milestones in the past twelve months. So, I did make several other quilts in its stead. For Alma, born November of 2012, because her mother meant so much to me during an uncertain time in adolescence. These quilt squares taught me core quilting skills, many of which I'd yet to learn, in the Whipstitch Your First Modern Quilt online course. I finished it on Christmas Eve -- just in time -- so I could give it to Ben's parents for Christmas. This was also my first official free-motion quilting project, since I usually tend towards straight line quilting, it was a fun challenge outside my comfort zone. This was also my first quilt with intentional sashing. Obviously the mac daddy square here is the tumbling block, with all those y-seams, but my favorites wound up being the Card Trick and Ohio Star blocks (third row, middle and right blocks). This project was last-minute for sure, but I knew once I bought my plane ticket to Jake's snowy April Michigan wedding that there was no way I could pass up the chance to make my closest cousin a quilt to celebrate his marriage. I used vintage mens shirts in bright, native prints that I'd been keeping in my stash for years, waiting for the right use. I found them together, red base and pink base, at a Goodwill years before. For this midwestern couple, I was picturing masculine winter wardrobes and cold nights where it's cozy inside. 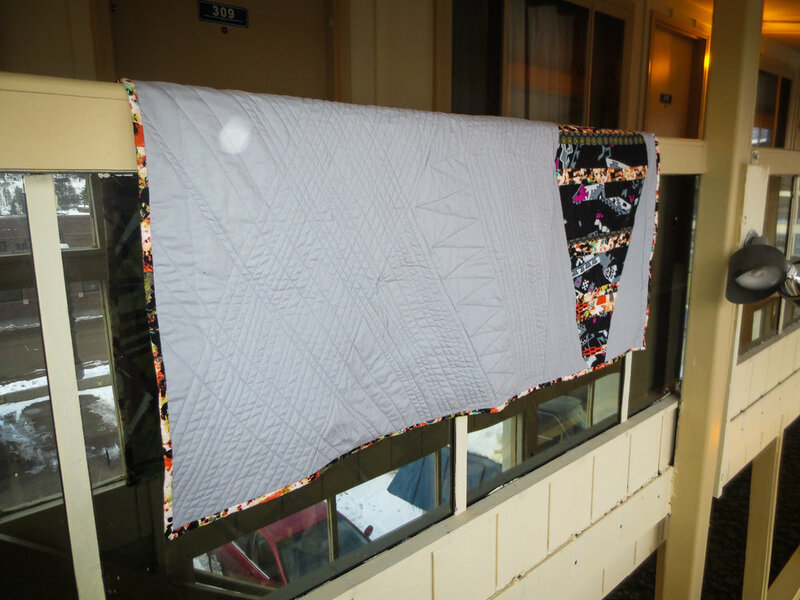 This was another quilt that I finished the hand-sewn binding on in the hotel room on the day of the wedding. Check out how much snow was still on the ground in mid-April Houghton. I won't go into too much detail on this here, because I've already explained the inspiration, technique, and process of the pixel quilt here. I'll just say, this required the most prepwork, advanced planning, and math I have ever put into a quilt. It also marks the first time I created a pattern on my own that I've actually mathematically calculated and written out. My usual made up pattern is in my head and involves a process called winging it. (Like Jake's quilt above.) Recreating the Great Lakes and the state of Michigan in 2.5-inch squares of fabrics obviously required the exact opposite kind of creative process. But it was probably the most rewarding and exhilarating quilt I've done yet, as I watched it actually start to look like something. Lauren and Dave are both natives of Michigan now living in Georgia, just like me. They were married in June 2013. My best friend (we just celebrated or 13th "anniversary" on September 21, 2013) Ashley Watson is about to have her second child, a boy. Her due date is actually tomorrow (September 25) but I'm still holding out hope she goes into labor today and that we'll share a birthday. (My mom's due date for me was September 25 as well.) I don't know the name yet, but I had this quilt in mind ever since I visited Austin, Texas for QuiltCon back in February, and I didn't know the gender but knew I needed to use the math-and-grid fabric from the Archictextures fabric line, since both the kid's parents are math teachers. 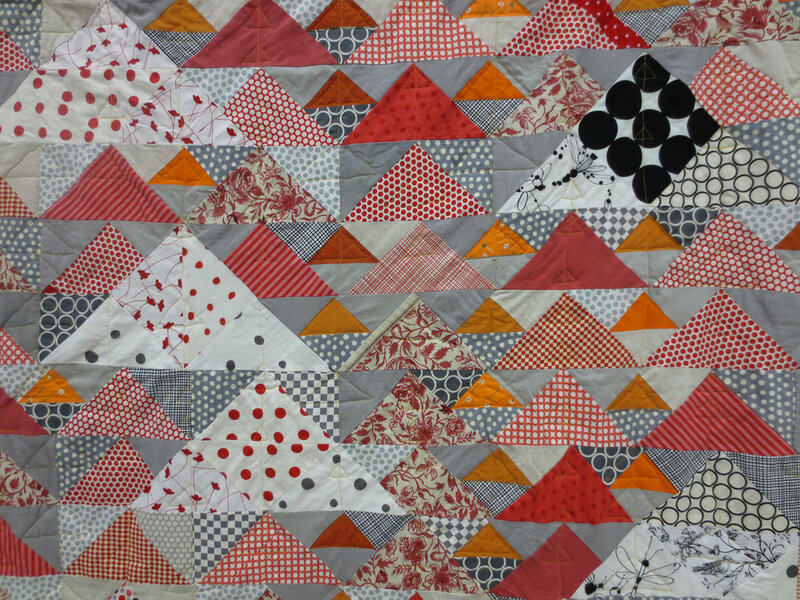 I also used a chain link garden path quilt pattern I bought at QuiltCon on a whim -- I rarely buy patterns for quilts. But I really liked the non-square shapes and those little angles in the corners. So I kept making squares until I ran out of all those fabrics. Hope it's big enough for the little man Watson when he arrives. Achieved: Five quilts, none that are flying geese, but all were given as gifts for people I love. Two wedding quilts, two baby quilts, one Christmas gift. For clarity, because quilting friends might be wondering, the baby quilts are both about 35" x 50" and the other three are comfortable lap-size quilts, about 50" x 65" to my memory. Those aren't exact numbers at all. But, for example, the Michigan quilt is quite large, not a wall hanging like it was originally conceptualized to be. I'd say it's been a pretty good year of goal-reaching overall. It's been important for me to have these personal goals and creative outlets as I've struggled with finding meaning in the variety of positions I've had professionally in the last twelve months. Like many probably, my passions are in what I do after my day job. Shocking though it may seem, marketing an ad hoc reporting platform is not what I set out to do when I earned two degrees in history. Still holding out for the grand possibilities I see in the year ahead (and years ahead) within the field I'm trained for. But I'll still be writing, and quilting, and yes, sometimes running, no matter where my career leads. Here's to the year ahead.